Being a huge sugar/pastry/chocolate addict of sorts I think I have found the bakery of my dreams. The place I’m talking about is Silver Moon Bakery located at 2740 Broadway. Yeah, it’s waay up there in the Upper West Side. I went there once a few years ago before I reached my epiphany with food and underestimated the quality and goodness this establishment has. All I remembered that it was good but I didn’t remembered how good it was. Since I was doing research for fabulously great muffins from a suggestion from one of the commenters, I wracked my brains and remembered I went to Silver Moon and try out their stuff again. I got there pretty much at opening time at 7:40 AM on Thursday morning. It took me a good 3-5 minutes to make up my mind what the heck I wanna eat! There’s so many good looking pastries, bread, etc. that I was undecisive! Eventually, I settled for a blueberry scone ($2.40), a chocolate chip brioche ($2.45) and a small coffee (forgot how much) with tax comes out $6.55. That’s for my breakfast and lunch, ok? So it’s arguably calorically reasonable. Just forget the fat content thing so my conscience won’t get the best of me. The blueberry scone was still warm when I actually start breaking it apart for photos. It had a crisp exterior and a soft, flaky crumb interior. 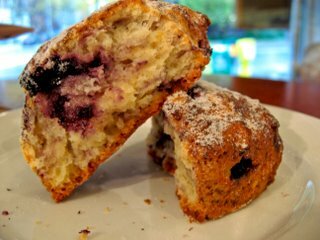 It bordered between moist and dry for the interior and the flavor of the scone had a small amount of blueberry and there’s actually visible specks of orange zest in them, which was a nice surprise. 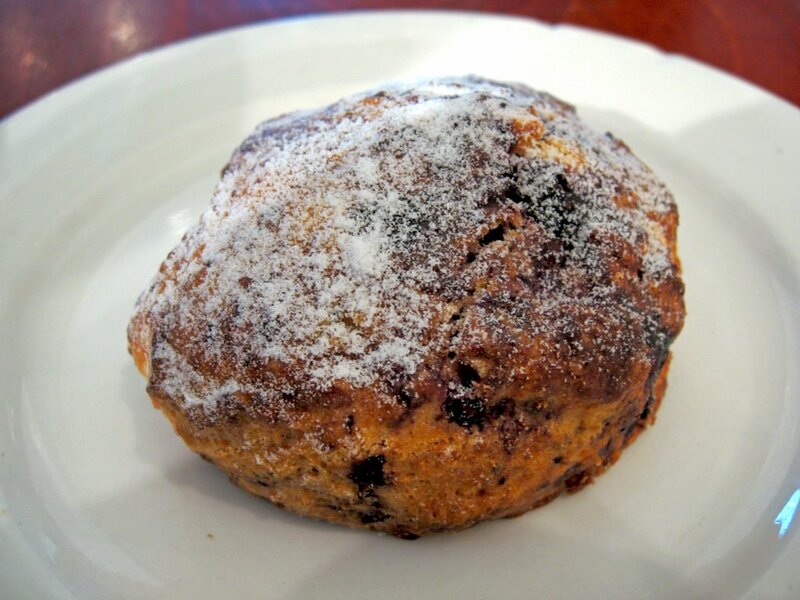 It’s not bad but it’s not the best scone. Eh, I’m still searching for the best scone. The coffee was good and strong. But it’s more like a bright, acidic flavor than dark, bold and robust. The chocolate chip brioche is very soft and buttery from the feel of it, when I broke it apart. It’s sandwiched a good bittersweet (70%) chocolate. It’s not very sweet. The only sweetness it has is lended from the sugar crystals on the top, as well as the crunch. It’s pretty damn good. Ooh, I should mention this. After I took pics of the food and started to nibble my scone and scribble down my notes about this scone, an older local woman (possibly in her 40s) wanted to take a small share of my table and I let her do so. She had a fruit yogurt and coffee. I felt kind of guilty from eating all that is buttery and sweet, while she has something modestly healthy. A few silent moments passed while we’re both eating our breakfast items when she started to talk to me again. This time she commented about my scone. She said the apricot scone is a lot more moist than the blueberry, which she finds it dry. Then she started to suggest me things that she claims that are fabulously delicious and good. Seeded ficelle that is out only on Fridays; it’s one of their specialties. I replied to her, “I love seasonal foods.” I tend to eat seasonal anyways. I had a great baguette here with apricot pieces in it, which probably isn’t the same thing as that bakery has, but..uh..damn I know where I’m going when i go back to NYC. I’ve been meaning to try Silver Moon, but never got around to it! Argh! PUMPKIN MUFFIN OH MY GOD I WANT. I expect to read your review of it! And the croissant! Yes. Robyn – LOL. Sure, I’m craving for that muffin since that woman recommended it to me! But I forgot to bring extra money with me. Damn. But I’ll go there tomorrow and report back soon. ok tina, i will trek with you up to this bakery cause yo know i have that weakness for pastry. thatt pumpkin chocolate thingie and chocolate brioche!!! Uhhh…do you mean the Dumpling House or somewhere else, Kim? This is a great post. Itâ€™s as if you wrote that article just for me. This blog has definitely come a long way since I first started following it. Thanks.